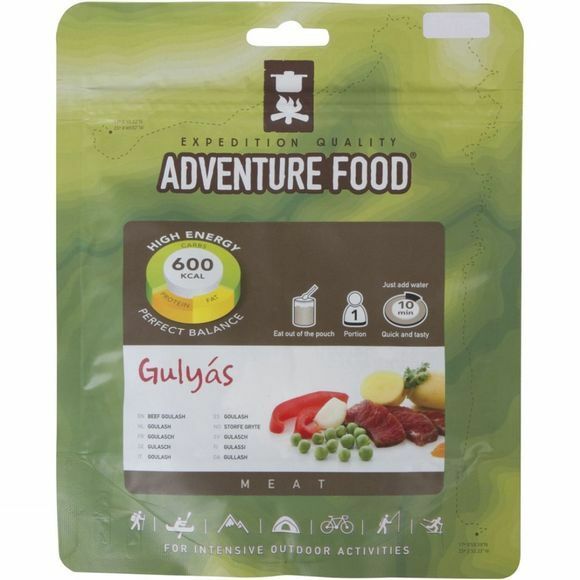 Adventure Foods Main Meals are dehydrated for ease of use and ease of carriage. Only adding a minimum amount of weight to your pack, they're extremely simple to prepare: open the pouch, add hot water, stir, leave. Eat! potato powder (potato, preservative (E223), antioxidant (E304), acidulant (lemon acid), emulsifier (E450, E471)), potato starch, herbs (paprika powder, cumin, pepper, cayenne, turmeric), rapeseed protein, onion powder, sugar, salt, yeast extract, aroma, sunflower oil, palm oil,milk powder, coconut oil, 7% beef, 4% bell pepper, mushroom, 3% peas, bouillon (soy protein, salt, glucose syrup, sunflower oil), garlic.